More than a thousand kilometres, about fifteen hours by road, up to five days if you consider taking part of the journey on foot. This is the terrain that thousands of people have decided to travel to attend the large demonstration called in Brussels to defend the independence cause. But what drives a sovereign to get his blanket or stele upside down in Brussels? 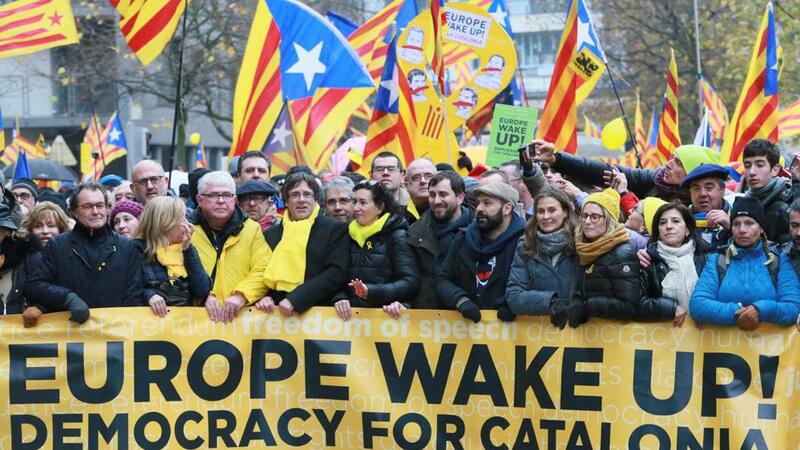 “We come to claim the rights of the Catalans in the heart of Europe. And make it clear that we already have the right to make our own decisions.” Jose, who together with Teresa has decided to take a plane to join the more than 45,000 demonstrators who have travelled this Thursday to the outskirts of Brussels’ European quarter. Is it useful to demonstrate in Belgium? Many carry cloaked flags, but Jose has wrapped himself in a community flag. He declares himself to be pro-European, although he is a little disappointed by the attitude of the European Union towards the Catalan matter. But I’m still hopeful, that’s why I came,”he adds. Criticisms of the European Union have been harsh, especially against the President of the European Commission, Jean-Claude Juncker. The demonstration called for “Europe, wake up”. And some of the participants, like Teresa, believe that the protest will be a turning point,”the beginning of a change that will come sooner or later. Others, however, are openly sceptical. Abdesadel has come with eight other friends in a van. “We are poor,” they declare. And their confidence in the European Union is limited. However, they have not hesitated to pay the French tolls – “70 euros in Lyon, and we complain in Catalonia”, joked Xabi to go to Brussels. We think it’s important to come here and support the cause,”says Abdesadel. It is more a question of the peoples than of the EU, of trying to build the solidarity of the peoples and for the people here in Brussels, in Belgium, to see what we have been through, what we are doing and to show a little solidarity with us,”he adds.